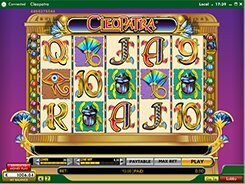 Cleopatra is an Ancient Egyptian-themed video slot with 5 reels, 20 paylines and a 10,000-coin jackpot. The symbol set includes the Eye of Horus, scarab, a few hieroglyphs that are found on and inside Egyptian pyramids, as well as six playing card symbols (Nine to Ace). A player may adjust a line bet ($0.05 to $10), and the number of paylines, so the maximum stake reaches $200 per spin. The Cleopatra symbol is a wild, wild multiplier that serves as a replacement for all symbols other than scatters, and doubles payouts when used in a winning combo. Hitting five wilds on a payline awards the jackpot as is said above. The Golden Sphinx is a scatter and a feature trigger, with these three, four or five unlocking 15 free spins when landed in any position. During the free spins feature all payouts come tripled. Furthermore, you will also win a cash amount with scatters as five of them pay out x100 times a total bet which is equivalent to a massive $20,000 on a max bet. With pretty graphics and generous payouts, Cleopatra will appeal to mid to high rollers and players who like history-themed slots. PLAY FOR REAL MONEY!